Melon is an ingredient used in Provisioning to make a variety of Food dishes. As a fruit-type ingredient, all recipes using melons will have an Increase Maximum Magicka effect. 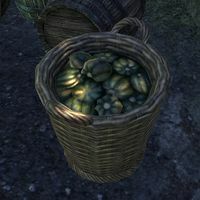 Melons may be found in containers throughout Tamriel, most easily in Melon Baskets. Or they can be purchased from Grocers for 00000150150  . 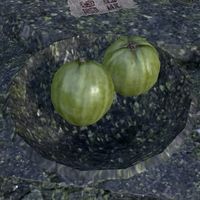 Starting with the Murkmire DLC, loose melons may also be found in various locations. This page was last modified on 3 April 2019, at 01:20.